Living and opening a business in the UAE has many prospects. All sum up to great opportunities for investing: 0% corporate and personal income tax, clear procedures in setting up the business, absence of bureaucracy, reliable and secure banking system, stable economic and political surrounding. One of the most frequently asked questions we get at My Business Consulting DMCC is about how and where to set up business in UAE, and which business in the United Arab Emirates is potentially the most promising? It is much easier to decide where to invest money, based on facts. Leveraging over 10 years’ experience on the market of business setup in UAE, we have developed a unique 2019 UAE market review. 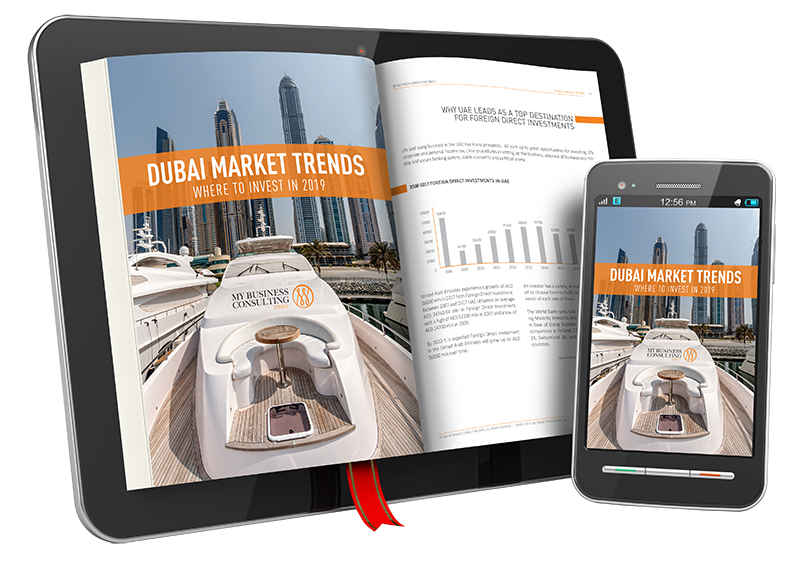 Download Dubai Market Review for FREE! The UAE consists of seven independent Emirates. Each of them opens its unique opportunities for business. You can establish your Mainland (LLC company) or Free Zone company in any of Emirates. When choosing a place to settle your life and business, it is important to consider the activity of your company as well as factors affecting the development of your future business in the UAE. Abu Dhabi is the federal capital of the UAE. Very green, beautiful and quiet. Abu Dhabi houses federal government offices, is the seat of the United Arab Emirates Government. Dynamic and modern business capital. More than 56% of all multinational companies are represented in Dubai. Dubai is well-known as a powerful global center for re-export and transit largely due to the port of Jebel Ali, which serves more than 140 destinations. Emirate is also a springboard for accessing promising markets in the Middle East, Africa, and South Asia, whose total GDP is projected to exceed 12.8 billion US dollars by 2030. Cultural capital of the UAE with lots of museums, historical places, educational institutions. The Emirate supports a culture of entrepreneurship and innovation. Focusing on manufacturing, real estate, gas, tourism, education, healthcare, logistics, and business services. Sharjah has 19 industrial areas. At the northernmost part of the UAE lies Ras Al Khaimah. The Emirate prides on its proven record of safety and stability as backed by renowned credit rating agencies such as Fitch Ratings and S&P. With logistical hubs such as seaports, international airport, and multi-lane superhighways, companies easily access the trade flows between the east and the west. RAK is the most industrial Emirate in the UAE. Mountains, islands, views and, definitely, the best diving in the Gulf. It operates a multipurpose port that offers access to major shipping routes. Other local industries include mining and stone crushing. Fujairah Oil Industry Zone (FOIZ) has become one of the top commercial players in the energy sector. The smallest of the seven Emirates. Although Ajman city is modern and provides up-to-date services and facilities, it reflects its traditional charm. The main sectors for business are construction, real estate, business and financial services, wholesale, retail trade, and repair. My Business Consulting DMCC was founded in 2009 and since then was crowned as a Top Performing Agent of Multi Commodity Center Free Zone (DMCC) for three years in a row, awarded as the UAE Most Innovative Business Advisory Firm, Best UAE Business Consulting Service, and awarded for Excellence in Corporate Finance Services. If you are looking for a reliable consultant to assist you in setting up your business in the UAE, you are in the right place as we leverage over 10 years’ experience and can craft hyper-personalized solutions for your business, matching your budget and all requirements. Don’t postpone your successful future in UAE and request a free consultation with our experts today!